"This is a deep fried Italian pastry that my grandmother used to make." In a medium bowl, stir together the flour, salt, and sugar. Add the egg, butter and vanilla, mix until dough becomes stiff. Stir in the sherry 1 tablespoon at a time until dough is workable and smooth. Cover and refrigerate for about 2 hours. On a lightly floured surface, roll the dough out to 1/8 inch thickness. Cut into long narrow strips, and tie into loose knots, do not pull tight. Heat cooking oil to 375 degrees F (190 degrees C). Oil should be about 1 1/2 to 2 inches deep. Fry ties in hot oil for about 2 minutes, until they puff up and turn golden brown. Drain on a brown paper bag or on paper towels. Dust with confectioners sugar while still warm. I followed this recipe exactly and there is simply not enough liquid. I ended up adding an extra egg, another tablespoon of butter and the sherry before it became dough like. 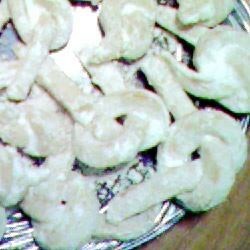 My nana always made these at Christmas, but I've never had the recipe. I haven't had them since she died suddenly 13 years ago. Thank you so much for posting this recipe. You made my Christmas! Thank you so much! I made these all the time when I was young and lost the recipe in all our moves. Thank you for placing this on the internet. I have missed them so much.